This was how I saw myself. I didn’t completely loathe myself, but I didn’t like myself either. At best, I tolerated myself. I felt I had good reasons to. I’d gotten myself into, as we say in England, a right old pickle. If you’re not familiar with this charming expression, I had gotten myself into a big mess. In my early twenties, over a painful period of about eighteen months, I’d gradually buried myself in personal debt with several pay-day loan companies. The ever-growing pressure to pay off this debt played havoc on my mental health. I often found myself running into the work toilet to secretly have panic attacks, throwing water on my face like a madman, and reassuring myself that I wasn’t losing my sanity. I was suffering, and misguidedly, I’d convinced myself I would have to suffer alone. To make myself feel better, each week I partied from Thursday through to Sunday, chain smoking and knocking back pint after pint of Guinness. Or anything else that was available. I wasn’t fussy. I’d wake up on a Sunday, often still drunk, with a dizzy head and a heavy heart. Do I dare to check my bank balance? How long can I go on living like this? What’s wrong with me? Sunday evenings were the worst. I dreaded Monday morning. I disliked my job but needed to stay there to keep my head above water. It was a vicious cycle. I’m pleased to say those days are behind me. I’m still far from being perfect, but I’ve come a long way. I’ve learned to like and even love myself. Which I’m proud of, because I honestly believe the most important relationship we will ever have in our lives is the one we have with ourselves. The quality of the relationship we have with ourselves determines the quality of all other relationships. Plus, I came into this world alone and I’ll leave alone. Other people will come and go, but I will always have myself. I best make sure I like the man I see in the mirror. 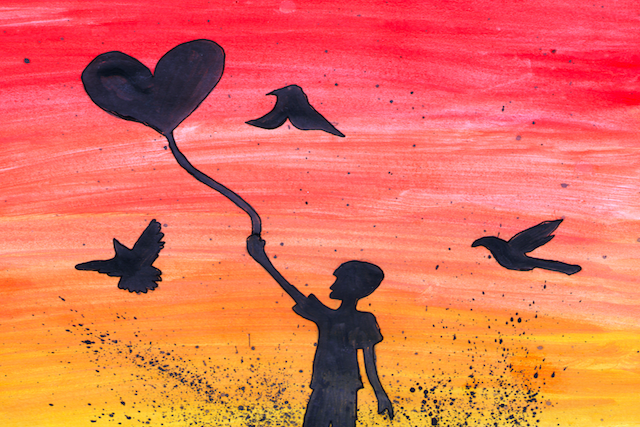 Here are three ways I learned to like and trust myself again. Yes and no. Yes, they are destructive, but I wouldn’t call them self-sabotaging. A more revealing question than what those behaviors are, is why do they exist? I believe it’s not self-sabotage but misguided self-love. Let’s take my binge drinking and smoking, for example—behavior that, in the eyes of many, would seem self-destructive. On top of the harmful physical and mental affects, these habits put me further into debt. But why did I indulge in those behaviors in the first place? Because my life situation was painful, and temporarily, they helped. For a few short hours, those behaviors made me feel better. I became less anxious and happier. As far as my mind was concerned, this was helping. The issue, as I’ve come to learn, is that the subconscious mind (the part of the mind responsible for habits and behaviors) focuses on the present moment. What is also important to understand is that the mind’s #1 role is to maintain our survival. If you’ve ever almost stepped into the path of a speeding vehicle, you’ve seen this truth. Without even consciously thinking , your incredible mind jolted you back onto the path and off the road. Given that the mind’s #1 role is our survival, the idea that it would allow self-sabotaging behaviors is nonsensical. Furthermore, believing I had a sneaky self-saboteur living inside me, hell-bent on destroying my life, made me feel utterly powerless. If I couldn’t even help myself, how could anyone else? Now I view those destructive behaviors differently, for what I believe they are: short-sighted self-love. “Helpful” in the short-term but costly in the long-term. I wasn’t sabotaging myself on purpose. My mind allowed those behaviors because they were moving me away from perceived pain, or toward perceived pleasure. With more awareness, I was able to stop beating myself up, stop the behaviors that we’re holding me back, and start making better choices. Which included asking for help and setting some goals for myself. Once I realized I’d always done my best in the past, given my level of awareness, it was time for me to think of positive steps I could take toward the future. Starting by gaining direction through goal-setting. In the past, I’d set myself up for failure by trying to change everything overnight. After a few days, however, I’d become overwhelmed by trying to maintain so much change and fall back into old, familiar patterns. This time, instead of attempting to change everything I wanted to change at once, I created small and achievable goals for myself. I started by addressing my personal debt, which was the biggest stressor in my life at the time, and a huge contributor toward my anxiety. Once I made some progress with my goal of getting debt-free, I created small and achievable goals in other areas. For example, I set a goal of meditating once per day. It wasn’t long before I was seeing improvements in my mental state. Over time, my confidence in myself began to grow, as I could look back and see tangible results. I was beginning to like and trust myself again. A huge contributing factor in forming a better relationship with myself was praising myself along the way. As I child, I was fortunate in that I was often praised by the adults around me. Sadly, as we transition into adulthood, outside praise tends to become less frequent, doesn’t it? It did for me at least. As I grew older, instead of hearing words of praise, I heard more words of criticism from mean teachers and bosses who used shame and fear to motivate me to do better. No wonder, then, that my inner dialogue became more negative and I learned to beat myself up. Although I may no longer be a child, I’m not ashamed to admit, I still love to be praised! So, to encourage myself when making positive changes, I use self-praise each evening before bed. When brushing my teeth, I look myself in the eyes, reflect on the day that has passed, and think of three things I can praise myself for. Big or small, I find three things I did well and wish to acknowledge. Even on those days when I feel like I’ve achieved next to nothing, when I ask myself “What can I praise myself for today?” my mind searches for answers and will always find some. Even if it’s something small, like resisting the urge to overdo it when drinking with my friends or not oversleeping on the weekend. I used to go to bed and ask myself “Why am I so useless?” I’d fall asleep with a feeling of dread in my heart, resentful toward myself. By asking myself “What can I praise myself for?” I fall asleep feeling positive about myself, as someone who likes and trusts themselves. If you’re having a hard time liking yourself, let alone loving yourself, start by recognizing you’ve always done the best you could. Even when you made choices you later regretted, you were trying to help yourself; you just didn’t have the awareness or resources to do better. Then focus on taking small steps to create change you can be proud of. Don’t try to make major changes overnight; you’ll likely get overwhelmed, feel even worse about yourself, and give up. Just do one tiny thing every day to help you move you in a better direction. And give yourself a little credit. Ask yourself questions about what you’re doing right, not what you’re doing wrong. You’ll likely feel a lot better about yourself and your life. And when we feel better, we do better—which means you’ll keep giving yourself reasons to be proud. The post How I Learned to Like and Trust Myself Again (and How You Can Too) appeared first on Tiny Buddha.